I’ve been thinking about why I started the Studio Notes blog two and a half years ago. The main purpose was to work out my ideas about creativity through writing about it. My thinking was I would share these thoughts with others interested in pursuing their own creativity to help people get excited about their own creative pursuits. Reflecting back, every Studio Note article has this goal of sharing creative inspiration to spark an inspiration in others. 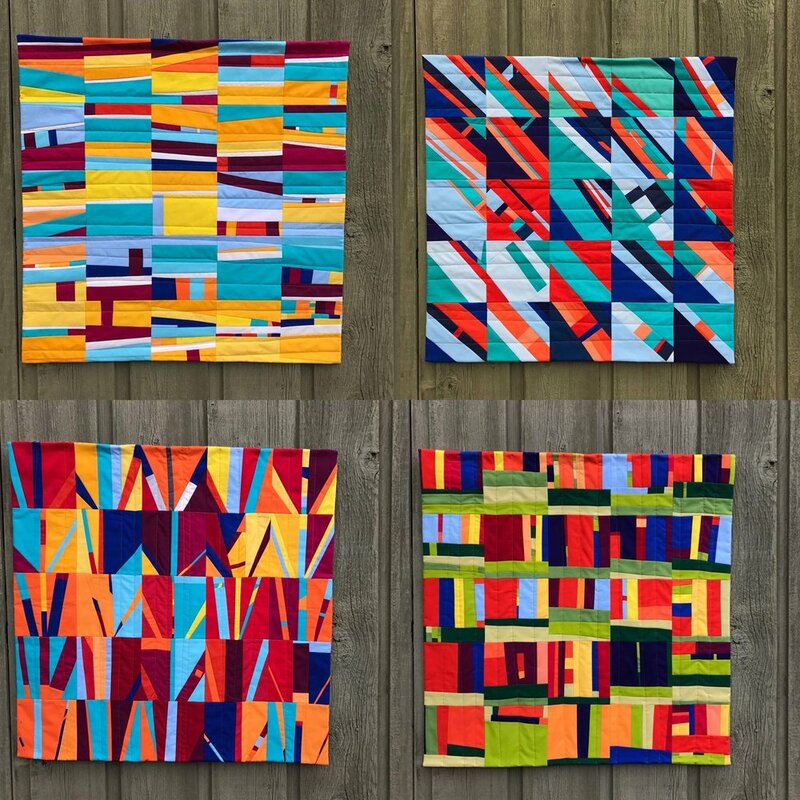 So while I often share my current projects writing about my design and actual sewing process, I decided to share things that have been inspiring me on a more consistent basis in hopes of helping inspire you readers. I agree. I want to be a curious idiot. Come join me. So I will be adding a segment called Time to Share or another creative title that I have not been able to come up with yet. I will share an article/podcast/image that got me thinking about creativity in order to inspire you to think about your creative pursuits in a new way. I am starting out with one of my favorite things to do to learn about something. PODCASTS!!! I have been listening to podcasts regularly on my commute to work. It helps me get excited about a rather mundane task of driving. I have limited my podcast playlist to a few favorites. I use the Pocket Casts app to organize them. One of my favorite podcasts is Freakonomics. You don’t have to like economics to be interested in this podcast. The topics are interesting and so well researched and a little out of the ordinary in what you would expect to hear about. They recently did a series on How to be Creative. Click the link above to hear the various episodes. I am working my way through all of them. I love everything about this series of podcasts. It gets me thinking. It’s a real winner. As for the 100 Days of 4 Colors, I am patiently creating a five and a half inch square every day. The first 25 days focus on the color purple. 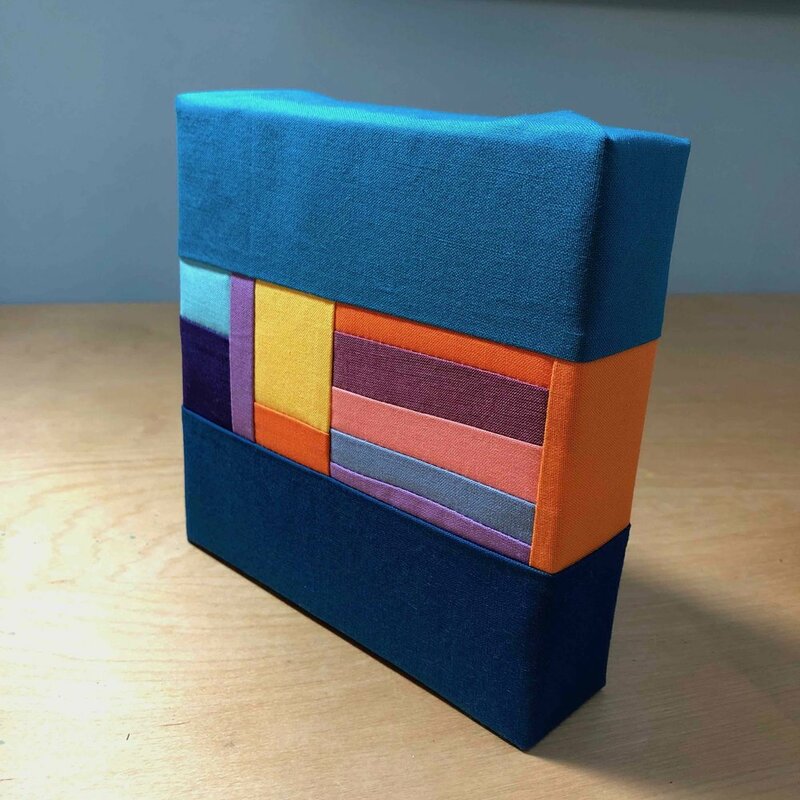 I had a few different titles in mind for the completed 25 day piece when it is all sewn together. My first title idea was Lavender. I love images of fields of lavender where that is all you can see far into the distance. However now I think I’d like to change the title to Irises because they bloom in early June and always remind me of my husband because his birthday is near the bloom time. As I am every 100 days project, I am reminded that small steps every day can create big things which is a good metaphor for a life well-lived. See the 100 Day Project in action on my Instagram page. Just Click. The Brushwood Center staff decided they could help people be more creative and keep art supplies out of our landfills. Helping people and the environment. We can clear out our old supplies we no longer are using, (guilt free!) and purchase low cost items we want to use. And, even better, we can use this creative space to play and create art. If you live around Chicago, click HERE to find out what art supplies they accept as donations. The BASE Grand Opening is Sunday, March 10, 2019 from 1-3pm and I will be there! 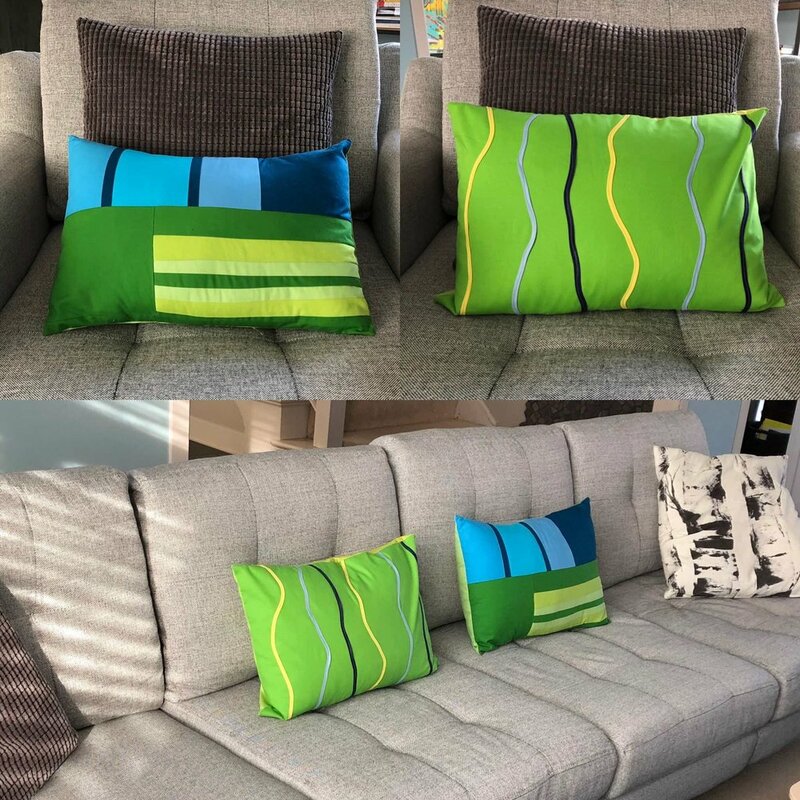 Come see my Art Demo using BASE’s 1970's Singer sewing machine demonstrating how to make a Contour pillow cover, an easy-to-sew pillow cover project I designed with a graphic modern design. My inspiration for this project is something I found at BASE, bias tape. Bias tape is magical stuff. Curves are a challenge to sew sometimes but not with bias tape. 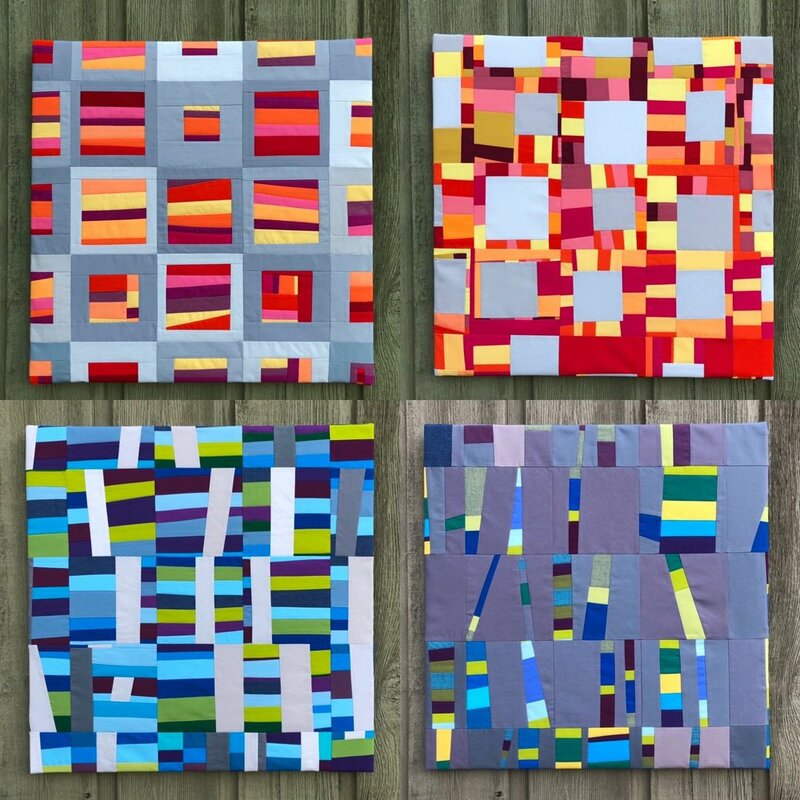 Stop by to learn some design secrets and versatile uses for bias tape. Why is BASE so exciting to me? One of my dreams is to play with acrylics and watercolors and try different media. I don’t have the space or inclination to get all the supplies for this. Now, I can go to BASE on a Saturday morning or Tuesday evening to play on a regular basis. A lovely space and a set time to create, even better than a spa day. There are many people who will benefit from this type of creative space. Curious creatives who want to try new things, like me and people who know they want to add more creativity into their life. Creative pursuits help balance out the stress of every day life. But sometimes it is hard to know where to start. BASE is the kind of place to start. It can give you the freedom to play with no fear of failure. To get people engaged, BASE will have monthly challenges and opportunities to share on Instagram. You can meet friends for a night out to create, have office retreats as a way to do an activity together. The possibilities are endless. If any of my local readers want to meet me at BASE to create together, send me an email. Let’s do it!! I will share photos of the Opening Day of BASE in my next article. 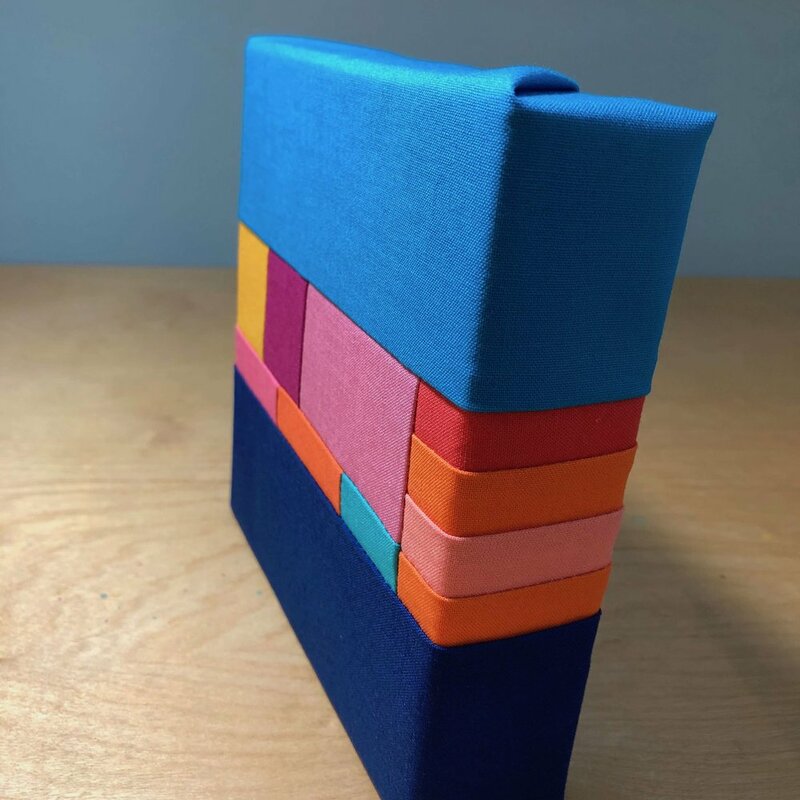 In the Studio this week, I created a piece entitled Corner Inserts. I woke up one morning thinking about this design. I started with a square cut diagonally then added an insert fabric. Step two, I added two strips to the square like a half log cabin design and cut diagonally then added another insert fabric. Then repeated. This process was fun enough that I want to try it again. Last week, I created Pieces. Loads of color. Loads of different shapes. Improv sewing at its most fun. After two months, I went back into the studio. Holiday travel, work schedules and lack of motivation conspired to extend this hiatus from my studio for more weeks than I would have liked. It seemed normal to not be in the studio. For me, this felt very wrong. 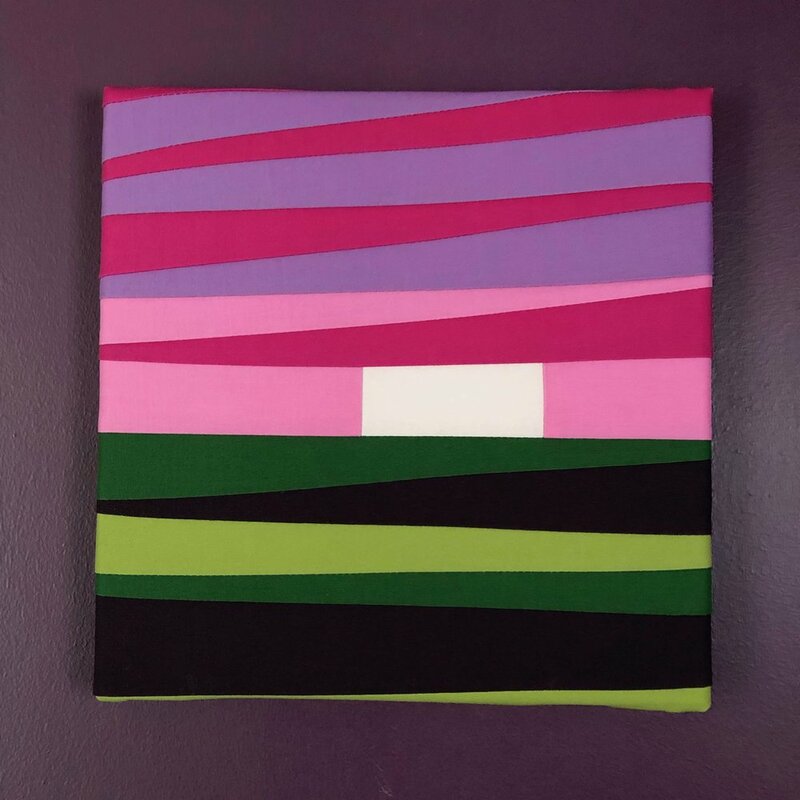 Cotswolds Sunset, Kona cotton, 10” square, February, 2019. 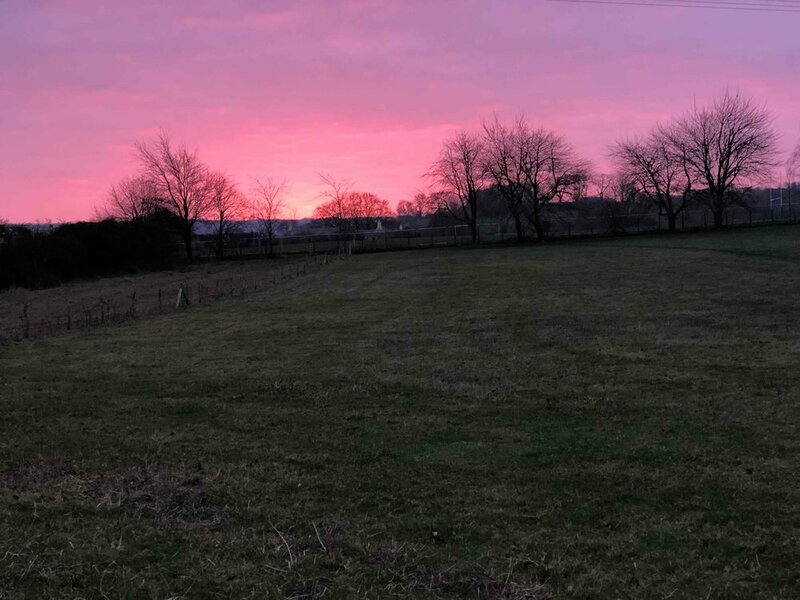 Even if I was not sitting in front of my sewing machine or cutting mat, I was thinking about the sunset photo I wrote about in the article British Landscapes. The day dreaming revolved around the colors where the shadows in the grass field made the landscape appear dark brown and the sky had about 1,000 shades of lavender, pink and magenta. How do I turn this into fabric art? I really had no answers when I walked into the studio but knew I had procrastinated enough when I called the cable company and the repair man for our blinds. Time was up. Why DO people procrastinate doing things they really DO want to do? So I got myself into the studio. First, I got out my fabric bins and looked at the sunset photo for inspiration. I selected 3 pinks, light, dark and medium. The grassy field colors were trickier. This was a fallow field where sheep had grazed. In other words, some dirt and some grass left over from the sheep uneaten. I selected an olive, a dark green and a color called raisin which is like a dark purple. Again, a light, medium and dark color. For the design, I wanted a horizon line and a lighter color on top of the line to represent the setting sun. As for the rest, these three colors for the sky and ground need to be interrelated but not horizontal lines. The old trick of sewing wedges of fabric together to make a rectangle appeared out of nowhere in my mind. 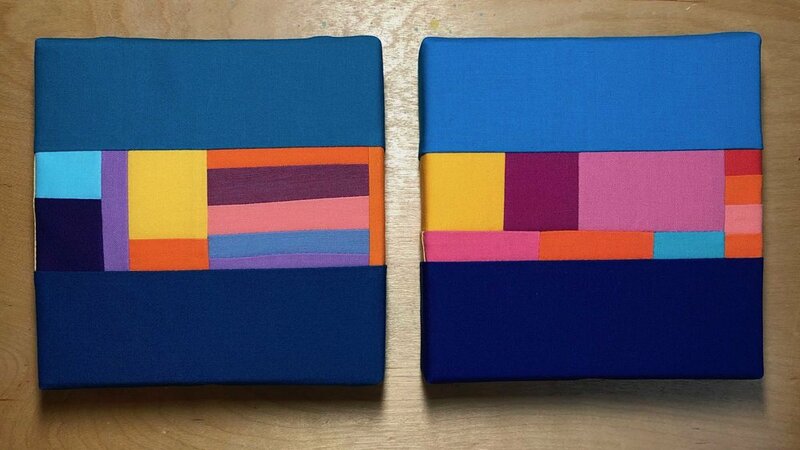 Then I started cutting wedges and sewed them together alternating the colors for above and below the horizon. Last step, sew the sky to the land. One of my friends who reads these articles asked me once, “Why don’t you ever tell us how to sew together a project?” Reading the article makes her want to sew something but she doesn’t know how. A long time ago, I decided I would not write tutorials or step by step guides. I wanted to write articles to inspire people to create their own way in their own style. However, if you are looking for a sewing project that is fun to make, this could be it. I love process based projects. So I have outlined the process I used below. 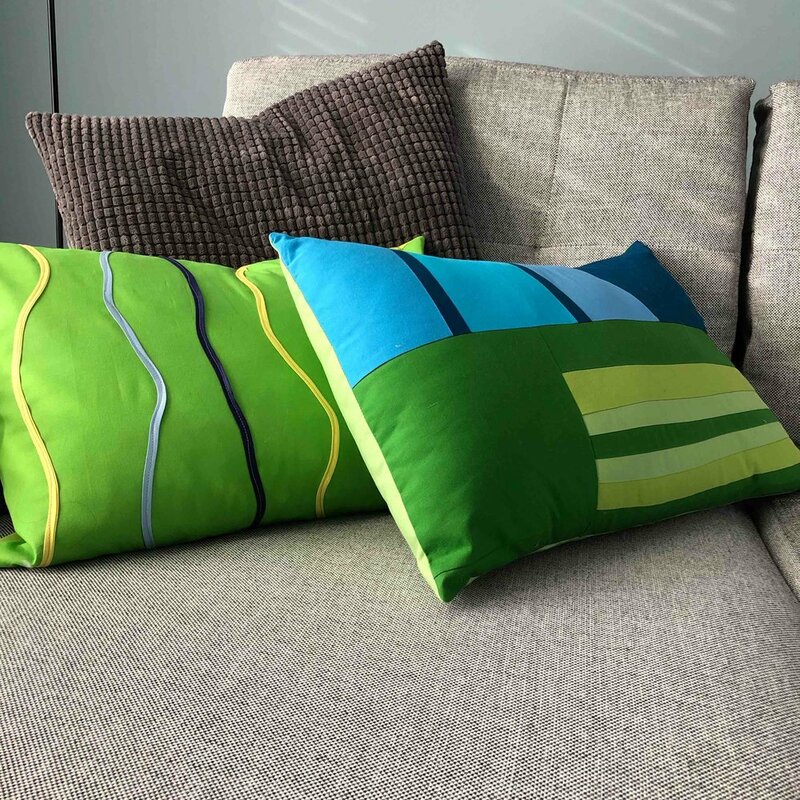 Pick your fabric - at least 3 colors, light, medium and dark colored fabrics for two groups. One group of 3 for the upper section and one group of 3 for the lower section. Cut wedges of fabric- length can be whatever you want. I used 13” for the length and then the wedges vary from 2-4 “ wide. I do not measure but cut intuitively. Sew 2 wedges together- stagger the wedges and sew the smaller side to the wider side so it makes a rectangle. 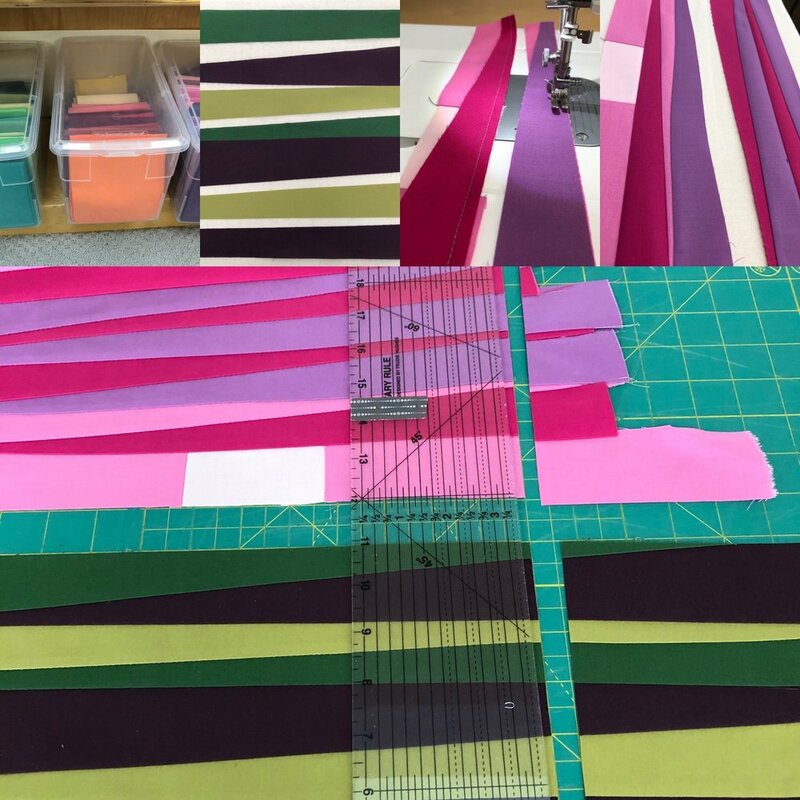 Sew the pairs of strips together- make your project as big as you want. 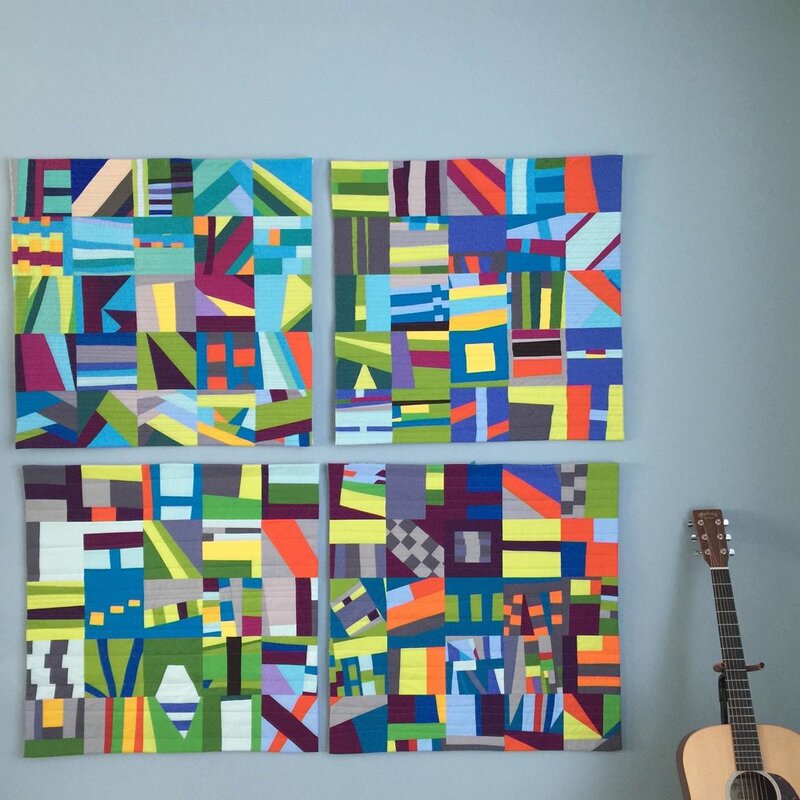 Get ready to display the final project-wrap it around a stretched canvas and staple or put in a frame. Upper Left to Right: Fabric bins, Wedges for fields, Sewing wedges together, Sewing groups of wedges together. Lower section: Sky and land cut to 13” and ready to sew together at the horizon. Aicular crystals in talc-schist from Tyrol, Austria: Australian Opals: Ladies slipper shaped pyrite from England: World’s largest topaz from Brazil. 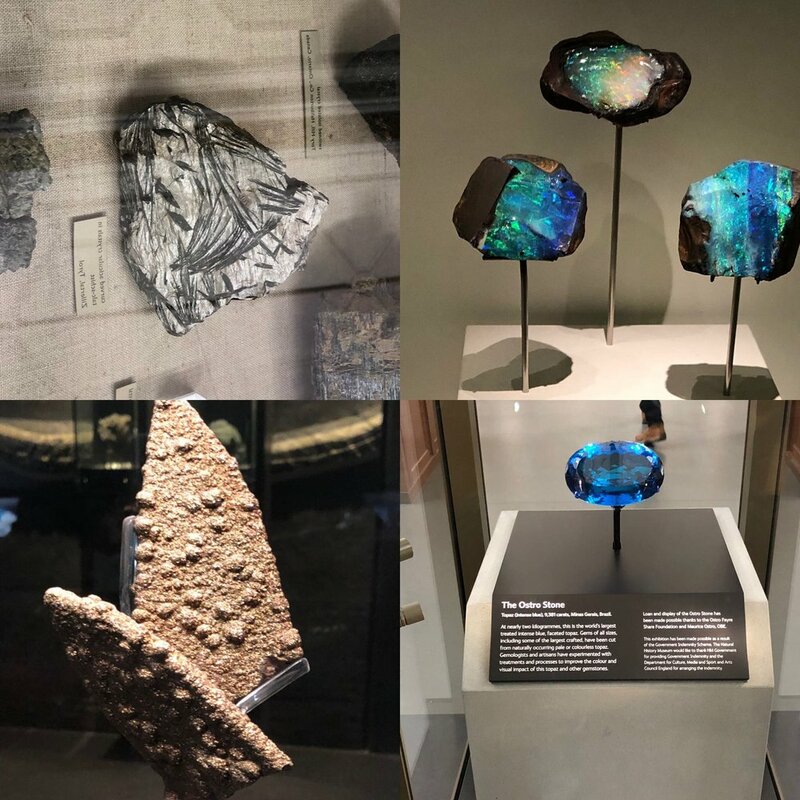 All from the Natural History Museum in London. We spent a lot of our time in London walking around museums. In particular, I was looking for interesting color combinations and some new inspiration for designs for my art. I found something to inspire me at each museum. The Natural History Museum had a spectacular wildlife and nature photography contest exhibit. They used a lightbox technology for the display of the top photos where light comes from behind the photograph displayed in the dark room and everything is very dramatic. Most of the photographs that I really liked included a lot of negative space around the main focal point. For example, a close up of a duck swimming in the water where the water is white reflecting the fog and it looks like a line drawing of a duck on white paper. One artist used drone technology to photograph seals lounging on a small iceberg with dark water surrounding the iceberg. It was very geometric and graphic with simple colors of blue, black and white. Right now, I’m in the “less is more” phase. I love that inspiration can come from a totally different media. Click to see a print of my favorite one, The Midnight Passage. The other highlight of the Natural History Museum is the ROCKS. The opals were magnificent and I will remember all those colors for future work. For design inspiration, I saw some of the rocks with long curved crystals immersed in a grey rock. Somehow I want to incorporate this into a future artwork, as well. In included other favorites in the photos in this article. Next up is the British Museum. The curators have created such wonderful displays. I love how they displayed the African pottery. They had a large exhibit on African cloth, both old and new cloth. 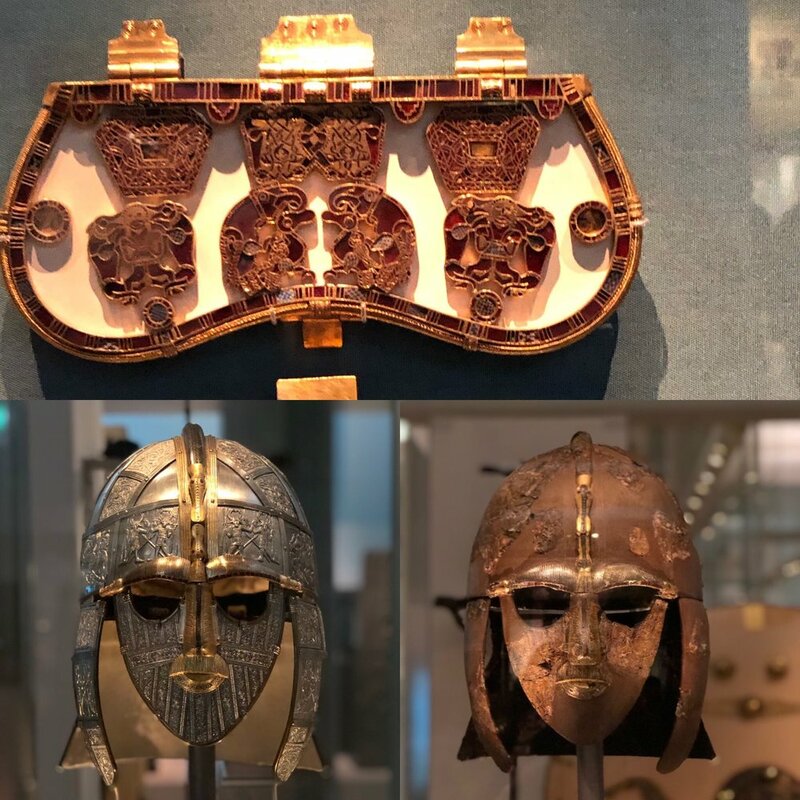 Another interesting thing about the British museum is they had contemporary art next to historical artifacts in the same exhibit from the same places. I was fascinated with this modern piece of art based on Ghanian kente cloth but made out of wood by artist El Anatsui. Kente Rhapsody by Ghanian artist El Anatsui. Full artwork upper right plus closeup on the left. African pottery on the lower right. All from the British Museum in London. The other inspiration was for the color combo of garnet and gold form the Sutton Hoo excavation. Gorgeous. I also loved the medieval helmet they dig up within this burial chamber. I have included photos of the pieced together original helmet and an artist rendition of what it would have looked like. The text around the exhibit said the poem Beowulf was shown to be more true than just just an allegory based on this archeological find. Sutton Hoo ship burial of an Anglo-Saxon grave dated early 600 AD. Purse lid of gold and cloisonne garnets and shiny reconstruction next to original helmet found on the site. The masterpieces of our human history shown in these museums from all over the globe is inspiring in itself. The colors of the rock specimens or the design of the ancient Greek friezes from temples in Athens are all inspiring. It comes down to color and design. The fun part of thinking creatively is to take two totally different ideas and combine them to inspire something totally different. Museums are a great place to let your mind wander and think up new combinations that have meaning for you in your art. So why am I sharing this with you? Hopefully you find this museum meandering interesting. But most importantly, I hope it inspires you to look at museums differently, as a way to get inspired to create your own art in your own way. This year I want to spend more time in the studio. To help free up more time to do this, I will be writing my Studio Notes every other week. So look for my next post January 23. 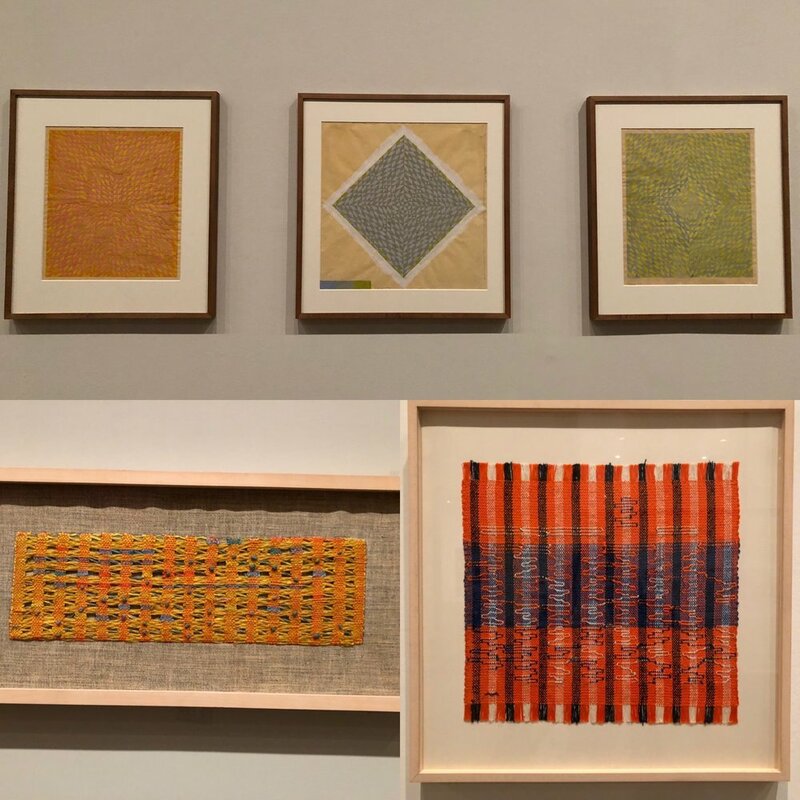 And get ready because the next Studio Notes post is all about the Annie Albers exhibit at the Tate Modern Museum. She was a weaver and associated with the Bauhaus movement. Loads of inspiration and hundreds of photos later, I’m still being inspired by her. There are 2 more Sunrises: Nos. 3 & 4! Each piece is 6 inches by 6 inches with a wide base of 1.5 inches so they can stand up by themselves. This is a Limited Offer just for my Studio Notes Readers. Please make your decision by 12.10.18 so your Art has time to arrive safe and sound. Each piece is $65 including shipping to the continental USA. Click either button below to pay with Paypal or ask me any questions. Be sure to let me know which Sunrise you would like and where to send it in the Paypal link. Interested in letting your loved one choose their own art? I have gift certificates available. Just click the CONTACT ME WITH ANY QUESTIONS button below. I want to pay with PayPal now! It is that time of year again… Time for a Yearly Review. In the past I’ve written about end of year reviews, here and here. 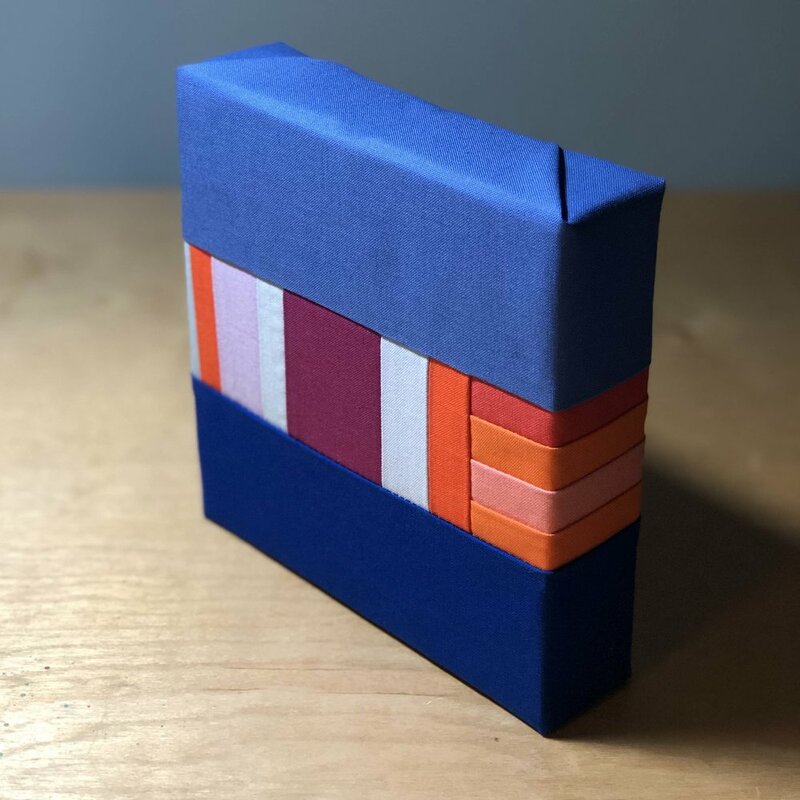 This week I was reading a recent blog post by Leo Babauta of Zen Habits where he wrote about a process he calls the Sacred Bow involving a yearly review done in a very interesting way. He describes the process here. I was so inspired that I have signed up for his monthly program of habit challenges through his program called Sea Change. I’m very excited to start. He’s one of those people that everything he produces and creates, I find very helpful. So I am happy to start this year long process of focusing on a new habit each month of 2019. The cost is $15 a month and you can stop anytime you like. An end of year review makes you appreciate all the progress you’ve made and help you solidify any lessons you learned from some challenges. This perspective helps set you up for thinking about what you really want to do for the next year. Of course, sometimes things change along the way but thinking about how you want to spend your time and how much you can actually focus on, is always a valuable lesson. You learn a lot about yourself. It is an opportunity to pause, stay the course or make a detour. I am looking forward to spending time doing this high level life review for 2018 and planning 2019. Lastly, some good news. I am going to London over the holidays. I am super excited about visiting the Tate Modern. Looking for suggestions from you all for museums to visit or must see places. Let me know! Honestly, I am in need of a creative reboot. A holiday break will do me good. I will soak in all the inspiration I can find over the next month and return refreshed. So I will be on a holiday break until January 9, 2019. If you really miss me and want to read my Studio Notes, here is my archive of all my weekly articles for the past 3 years, over 150 articles. Hopefully you will find something to inspire you. Sunrise No. 1 (on the left) and No. 2 (on the right), 2018. Looking for a unique gift for the holidays? Sunrise No. 1 (on the left) and No. 2 (on the right), November 2018. In keeping with the Holiday spirit ❄️, I am offering Sunrise No. 1 and No. 2 as affordable gift ideas to show someone you care. Yes! I want to give the gift of Art. Click this to pay with PayPal. I’m taking a holiday vacation this week for Thanksgiving. To all my readers in the United States, have a wonderful holiday full of things to be grateful for. Last year at Thanksgiving, I wrote an article on the Power of Gratitude. Still one of my favorite ones. Click to read it.